Vote for Clay Aiken on TBWE.com! Clay is on TheBestIdolEver.com page. That's the funniest thing I've seen in a long time. Those trinket ads show up in all kinds of places... in the back of crossword magazines especially. You nailed it perfectly, as you do every time. 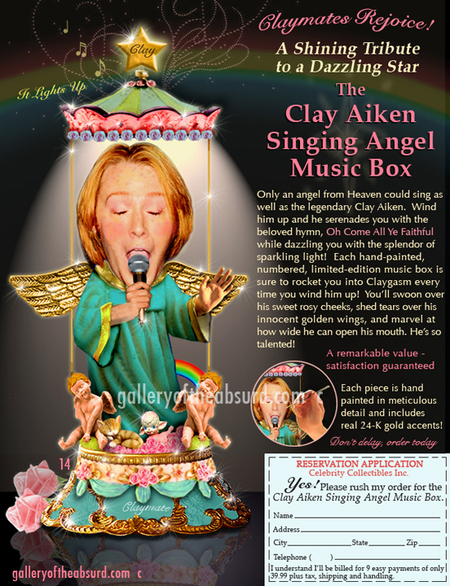 The way that little angel Clay is blowing the microphone is SO funny. And those claymates... they're actually scarier than the brangeloonies! I think he's a darling, but this is so-o-o funny! I love your parody of the Bradford Exchange and its horrific kitch. Yes, it is sooo appropriate for the Claymates! I agree with everyone else. I love how he is giving the microphone head. ambs and kitties and cherubs, oh my! And a rainbow peeking out the backdoor tops things off nicely. I know it's a spoof, but you KNOW there's a Claymate out there who go this picture and and trying to figure out where to get one. And for only 359.91? It is indeed claygasmic. 14, you are the bee's knees! Although I must say about five years ago, I use to watch the shopping network when they would sell all this horrondeous crap - I swear I didn't buy any of it - but I liked watching it because the announcer had this very soothing voice as she described all the little details on another piece of junk. It was like relaxing to the hushed sounds of golf announcers as they whisper about Tiger Woods upcoming shot. OMG - I cannot stop laughing!!!! Please please please tell me you are making a mint off of your site - you are one of the most talented bloggers out there. You have a room full of Claymates AND Bowie pictures? Who'da thunk it?! She's right about the licensing, you could be a CLAjillionaire! 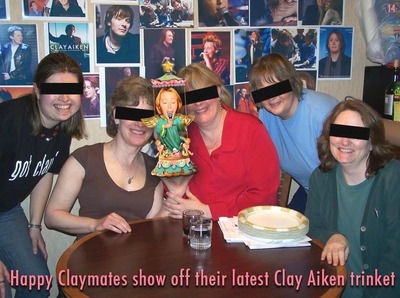 this is a perfect relic for claymates, who seem to use his faux-purity to hide their own strange perversions (lovely microphone there). And 14, you better patent that or whatever you're supposed to do. I'm not a lawyer. You can make millions since "Claymates" will buy 10 each. At least. Perhaps future versions should be made from an unbreakable resin. You did hear about the violent claymates beating each other up over a "tastes great - less filling" debate over which of his songs is best . . . Your digs aren't just digs...They're multi-tiered excavations of hilarity. Clay Aiken, celeb worship, and Thomas Kinkade, all stuck on a shiny paint-brush skewer and barbecued just right for some fine summer eatin'. Stop being brilliant for one minute, please: It's hard for most of us mortals to keep up. Claynifiscence in all his glory [whole]! Pulled up my fave site....I burst out laughing while at work. A co-worker looked over and asked me where she could buy the shrine. 14, YOU ARE A GENIUS!! You just know that Mr. Kink-aid is stabbing himself in the eyes with his vintage Gaultier/Mundaina bra cone, as he is beside himself with jealousy that HE didn't come up with this bit of genius himself! Love the way Clay is blowing the microphone. Um, re: the Claymates: Sheer. Raving. Lunacy. Are you sure that's a microphone? Looks like he's about to "service" someone. He's a pretty creepy and icky guy, some are even calling him the white(r) Michael Jackson. Aww. This will look perfect in his new baby's room. You did both Clay and Mr. Kinkade proud!